Welcome to the website for the 15th conference on Antiepileptic Drug and Device Trials, held every two years and sponsored by The Epilepsy Study Consortium in collaboration with the University of Pennsylvania and the Epilepsy Foundation. If you have any questions about the conference, please contact Mary Ann Brodie at the Epilepsy Study Consortium at: brodie@epilepsyconsortium.org. This is the fifteenth conference focusing on issues related to antiepileptic drug and device (AEDD) development from preclinical discoveries through clinical evaluations. 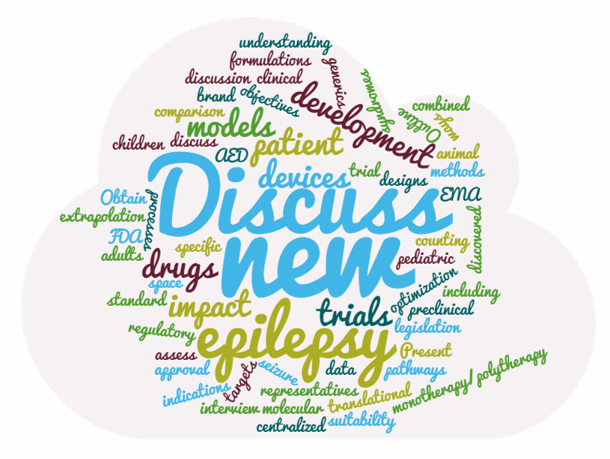 We are fortunate to have a robust epilepsy drug and device pipeline, fueled by excellent science and novel ideas. There are still unmet needs related to therapies that impact the underlying disease rather than treating symptoms (disease modifying or antiepileptogenic), and that provide benefit to treatment-resistant patients, as well as for orphan diseases. New innovations in therapy may face roadblocks such as complex regulatory requirements, increased payer expectations, and issues in data quality, but progress has been made. At each AEDD conference, we re-evaluate strategies to ensure continued advancement. There is always the opportunity to learn from the past as we move into the future. This symposium will bring together representatives from academia, industry, the NIH, and the FDA to review what has been learned and to discuss strategies to enhance AEDD development. ONLINE Registration: Click HERE to complete the online registration form and send secure payment via credit card. PAPER Registration: Click HERE to download a printable registration form, which you may send along with a check. The conference rate is $259.00 + tax and resort fee per night. Rooms all have king beds. This is a special rate for this symposium and available only early April 30, 2019. Please make your reservations early as rooms will be limited. This rate will increase significantly after the deadline. Junior Suite King- $479.00 per night (plus tax and resort fee); approximately 700 square feet with King Bed and pull out sofa bed. Junior Suite Double- $509.00 per night (plus tax and resort fee); approximately 700 square feet with 2 Queen Beds and pull out sofa bed. You may call the Reservations Department at: 305-932-6200. Please mention that you are part of the AEDD XV- Antiepileptic Drug and Device Trials. In an era where we have BROUGHT numerous new antiepileptic drugs to the marketplace, we need to be mindful of the unmet needs…. In an era where we have numerous new antiepileptic drugs (AEDs) to the marketplace, we need to be mindful of the remaining unmet needs, which should drive continued therapeutic innovation. New AEDs have consistently produced statistically significant improvement when added on to background drugs in patients with refractory epilepsy. Yet, the number of patients who become seizure free is small, and even fewer remain so over the long term. In addition, many patients are still plagued by drug-related side effects and co-morbidities. Finally, all of our existing drugs are for symptomatic relief (i.e. reduction in seizures). We have not even begun to approach the problem of epilepsy prevention, nor of a true “cure”, which would eliminate the ongoing need for chronic therapy. Despite how far we have come, we still have a long way to go. New therapeutic strategies are urgently needed. To this end, for more than two decades a group of individuals have been meeting on a biennial basis to discuss ways in which the process of bringing innovative therapies to patients can be expedited. Participants include individuals from academia, from interested government agencies such as the Food and Drug Administration/EMEA and the National Institutes of Health, as well as representatives from the pharmaceutical and device industries. The purpose of these meetings has been the exchange of ideas, discussion of roadblocks to therapeutic development, dialogue about regulatory strategies, and sharing of successful approaches. Over the years, discussions at this symposium have led to implementation of new trial designs, as well as new important analyses of trials that have already been performed. In addition, new regulatory pathways have been identified, particularly as related to approval of new antiepileptic drugs for monotherapy use. In addition, each meeting presents a pipeline of drugs and devices currently in development, and includes a Shark Tank competition, where novel innovations to improve the lives of people with epilepsy are presented. Discuss with FDA and EMEA representatives new objectives and legislation that have an impact on AED development. The Epilepsy Study Consortium, The Epilepsy Foundation and the Pediatric Epilepsy Research Foundation are inviting fellows and early career faculty interested in new therapies for epilepsy to apply for grants of up to $1,500 to cover expenses associated with attending our upcoming Antiepileptic Drug & Device Trials XV Symposium, May 22-24, 2019 at the JW Marriott Turnberry in Aventura, Florida. Registration fee will also be waived. Please see Guidelines to apply.